Apple presented a bold redesign of its MacBook on Monday, based on the conviction that users value portability more than they do the line of connectors typically found along the edge of laptops. 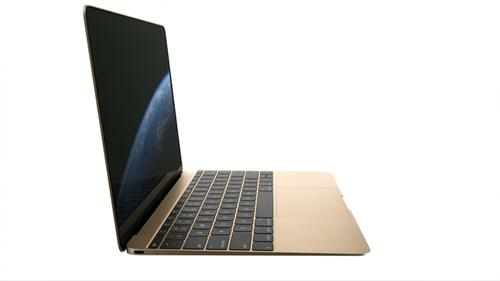 The new MacBook, which will go on sale in April, is the company's thinnest and lightest yet and is the combination of cutting-edge components from Apple's partners. It has just two connectors, but they do multiple duty. Based on the new USB C standard, each port can be used to connect power supply, HDMI, DisplayPort, VGA and USB devices. That might initially put off potential customers, but Apple's MacBook Air designs have often challenged users to accept what they aren't accustomed to in return for a lighter, thinner machine. Apple was among the first to dump the optical disc drive, Ethernet ports are gone and there are only a couple of USB ports in other of its light laptops. Apple has also embraced flash memory-based SSDs instead of hard-disk drives to further cut power consumption. Apple is emphasizing wireless connectivity enabled by 802.11ac WiFi and Bluetooth 4 rather than wired connections. To get the laptop thinner -- it's 13.1 millimeters at its thickest point, 24 percent thinner than the MacBook Air -- Apple looked to redesign many of the internal components. There's a new keyboard that's a third thinner, a new touchpad and at the heart of the machine, the main circuit board has been cut in size by two thirds. A large part of that reduction came when Apple removed the fan that's used in other laptops to keep the processor cool. The new MacBook doesn't have a fan, which means the computer runs silently, but the heat from the processor still needs to go somewhere. Apple didn't explain its new cooling mechanism, but the all-metal body of the laptop might be a clue. In all of the left-over space, Apple has crammed batteries. It's using an innovative layering technology to squeeze cells into areas that were too thin in the past, giving the machine enough life for 9 hours of web browsing or 10 hours of iTunes movie playback, according to the company. It weighs 2 pounds (about 900 grams) and is available in gold, silver and grey. The result is the "most extreme and efficient notebook we have ever created," said Phil Schiller, Apple's senior vice president of worldwide marketing, during an event in San Francisco. The computer has a 12-inch screen with 2,304 by 1,440 pixel resolution, that's a 16:10 aspect ratio. The base model comes with a 1.1GHz Intel Core M processor, 8GB of memory, 256GB of storage space and will cost $1,299. A model with a faster 1.2GHz processor and double the storage space will cost $1,599. Both will go on sale in the U.S. on April 10. The laptop PC market has been in steady decline in the last few years. IDC forecasts shipments of 169 million portable PCs worldwide in 2015, down by 40 million units in four years, but Apple is maintaining a number three position in the U.S., behind HP and Dell, and a number six position worldwide.